Today Crytek announced Arena of Fate, a fast-paced five-on-five multiplayer game. Crytek's press release curiously does not mention the term MOBA , but the Arena of Fate site calls it a "free-to-play action strategy game." If it walks like a MOBA and quacks like a MOBA, well, it's probably a MOBA. MOBA, in case you forgot, stands for “multiplayer online battle arena,” and Crytek's game has the word “Arena” right there in the title. 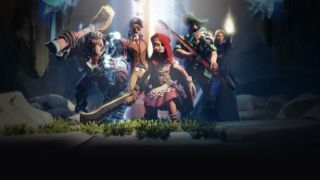 The look, size of the teams, and selection of characters also suggests that Arena of Fate will bear more than a passing similarity to League of Legends , Dota 2 , and every other game in the packed genre. For its setting, Arena of Fate is using recognizable characters. Most of them are pulled from fables, but there are some real names mixed in, too. The game's official site currently lists Robin Hood, Tesla (as in Nikola ), Joan of Arc, Little Red Riding Hood, and Fenrir , who I'm assuming is also playing double duty as The Big Bad Wolf. Crytek says Arena of Fate will enter an early access beta on PC this summer, which you can sign up for on the game's website . E3 attendees will also be able to play it on the show floor, so expect to hear more about it then.